This series is designed to teach you the foundation of human movement that all successful fitness programs are built upon. Over the course of 5 weeks you will learn the hows and whys of proper movement. Receive expert instruction on the 9 foundational movements and learn how to properly adapt them to any fitness level. Learn why mobility is important and how to effectively improve your range of motion with less than an hour per week of work. There is no experience needed for this class. We will teach you from the ground up. If you have been told that fitness is important but are lost as to where to start, this is for you! Use the link below to enroll in class and guarantee your spot. This year lets conquer the obstacles. The ones that stand between you reaching the same fitness goals that have made your “resolutions” list year after year. If you turned over a new leaf today how different could your life be by the close of 2018? We understand trying out something new can be intimidating. People get stuck doing the same old thing that doesn’t work simply because they don't know any better. No one wants to feel like the bumbling fool in the middle of a group class full of spandex clad hard bodies moving in perfect unison. Those of us who teach fitness have forgotten what it's like to be a beginner. We've devoted so much of our time to time helping seasoned gym goers reach their optimal performance levels that we have lost sight of what it's like to start. That's why we developed Foundations of Movement and Mobility. We created a space especially for you, the newcomer. To provide you the tools to change your life in an environment that delivers the time and the expert guidance to learn the foundation. A typical "intro" session gives you the change to try out classes, expecting you to jump right into a fast paced fitness routine with zero background knowledge . This isn't an intro. We will start from ground zero to help you safely begin your fitness journey. You don't need an intro. You need to be taught what to do and why you should be doing it. You need an instructor not a motivator. You need an expert watching and teaching you, not someone doing choreographed movements with their back turned to you. We don't want you mimicking our movements or trying to copy the person next to you. We want to teach you about your body and what proper movement is. This is not a quick demo. This is slow and in depth. You will be given the chance to fully learn, ask questions and master each movement before advancing. Regardless of how snazzy a workout might look, everything breaks down to 9 foundational movements. Ever heard of a burpee? That’s just a squat, hinge, and horizontal press (pushup) combined into one fast series of movements. All of which are foundational movements. We will teach how to do them correctly and why they are important. After you complete this course you’ll be able to walk into any fitness class or gym with confidence. You will be able to improve your health without risking an injury or unnecessary wear and tear on your joints. We want to help you make 2018 the best year of your life. If you have the will and desire to make a change, you can rely on us for the rest. We call this class foundations because we want to spend time laying a foundation that you can build upon. Developed and taught by our co-founder, Aaron Egbert, to help you find fitness, instead of only helping the fit get fitter. Over these 5 weeks you will join a group of others who are ready to begin. Who weren’t afraid to start something new. Who realize the importance of starting from square one. Each class will begin with a dynamic warm up designed to help you shake off the day and get your body prepared for movement. Once your body is prepped the learning begins. You will be taught about the systems of the body, How improving them will directly impact your life and how we go about doing so. Once you know the why, it's much easier to accomplish the how. Lets face it, working out is hard. Doing hard things for the sake of doing hard things is silly. Doing hard things because you know how they will better your life is enjoyable. That is the make or break point. People who are able to maintain a fit and active lifestyle do it because they have faith of the benefits of doing so. That faith is built upon understanding how it will impact them. Those who haven't been able to maintain an active lifestyle have been told that it's important but haven't been taught why. You will be taught the "correct form" of the 9 foundational movements. You will be taught the movements and practice them with immediate feedback on how you're doing and what tweaks will allow you to continue to master the movements. You will learn what the regressions and progressions of each movement are and how to accurately apply them. You will see how the flashy movements that may have left you overwhelmed in the past are simple tweaks of these movements. Once you have the foundation, it's easy to sprinkle on the extras. Finally you will discover where you may be missing mobility and how that is limiting you. You will then be provided with the tools and techniques to address the issue. We all have missing ranges of motion. Things like plantar fasciitis, carpal tunnel, low back pain, frozen shoulder, knee pain when walking up stairs or simply not being able to touch your toes typically come down to soft tissue issues that are easy to correct. We will give you the tools, like actually give them to you, they are yours, take them home to use. We will teach you how to spot issues and the techniques to begin to correct them. 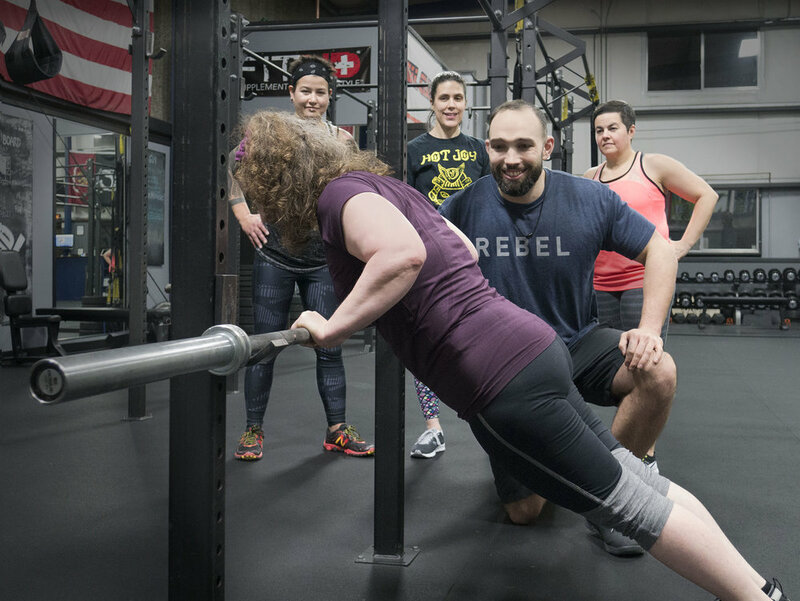 As we wrap up every class you will work on the common mobility issues that impact the movement you learned and address any questions that arise as you try the techniques. Will you be 10 pounds lighter by the end of this class? Nope. Will you be able to lift the biggest weights in the gym? Probably not. Will you be the fittest person in your next group class? Doubtful. What you will have though is the knowledge and confidence to accomplish your fitness goals. You will have the foundation to build upon. You now poses the ability to walk into a gym or a group class and discern if what you're doing is safe and effective. Whether it's one of our Rebel Fit classes, any other similar workout style, going to a general gym or working out at home. You will be well on your way to creating effective and lasting fitness. By enrolling in this class you're making the commitment to removing excuses. To beginning. Use the link below to enroll in class and reserve your spot. We've capped this class at 10 individuals to make sure that everyone gets the help they need and no one gets lost in the crowd. Unsure if this class is right for you? Use the form below to shoot us an email and let us help you figure it out! Thank you! We will be reaching out soon.